A delighted Nenagh Celtic captain Paul Walsh pictured collecting the Tipperary Cup at the Moneygall FC Grounds on Saturday evening following his side’s 4-1 win over Holycross FC. 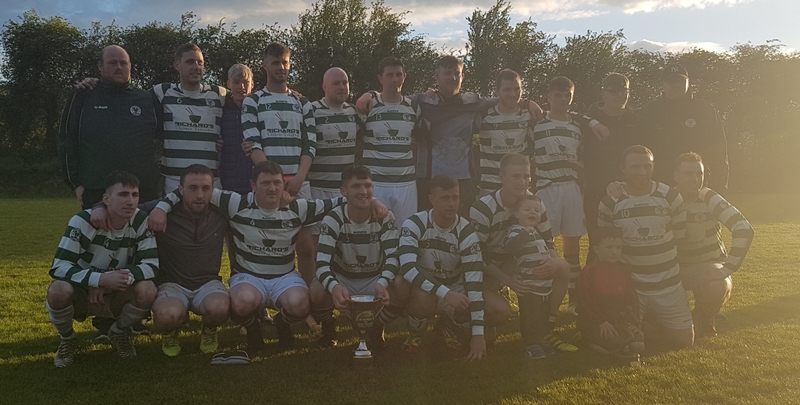 Defending champions Nenagh Celtic placed Tipperary Cup titles back-to-back at the Moneygall FC Grounds on Saturday evening when seeing off the challenge of a hard-working Holycross FC side. Nenagh Celtic proved the dominant force in this contest for the vast majority of the game and deservedly led by a comprehensive three goals at the break. Holycross FC certainly gave it everything that they had, but Celtic proved the much more accomplished side on this occasion. Captain Paul Walsh was outstanding at the heart of the Nenagh Celtic defence, Danny Ryan ran the game from the middle of the field, Brian Mitchell was lively throughout, Mark Walsh represented a vital outlet for his side at centre-forward and Jimmy Hynes won the man of the match award for his display on the right wing. Although Holycross FC will be disappointed with this result it is hoped that the experience will not negatively colour the memory of the season for Matt Vahey’s enterprising side - Holycross FC progressed through their division one campaign undefeated and also won the Barry Cup. Indeed, Holycross FC should eagerly look forward to playing Premier Division football next season. Nenagh Celtic - 2017-18 Tipperary Cup champions. Nenagh Celtic have huge pedigree in the North Tipperary & District League and illustrated as much on Saturday. Danny Ryan controlled the game from the centre of the field while Mark Walsh, Brian Mitchell and Jimmy Hynes ran riot up front. And, at the back Celtic were in no mood to concede an inch. Holycross FC were issued with a warning as early as the third minute when Mark Walsh crossed the ball sweetly from the left wing and Jimmy Hynes collected the delivery before cracking a rasper off the crossbar. The breakthrough materialised in the 18th minute - Philly Fogarty’s shot was deflected out for a Holycross FC corner; Celtic counter-attacked with Paul Walsh leading the break; the centre-half sent Jimmy Hynes away down the right wing and Hynes’ cross found Brian Mitchell who conjured a cracking finish. Nenagh Celtic turned the screw thereafter and the side managed by Kevin Flannery and Robbie Ryan doubled their advantage in the 30th minute after Mark Walsh’s shot was deflected out for a corner. Brian Mitchell floated his delivery toward the far post, Walsh knocked his header back across the face of goal and Michael Hynes, who is a real warrior for the Hoops, buried his header from close range. 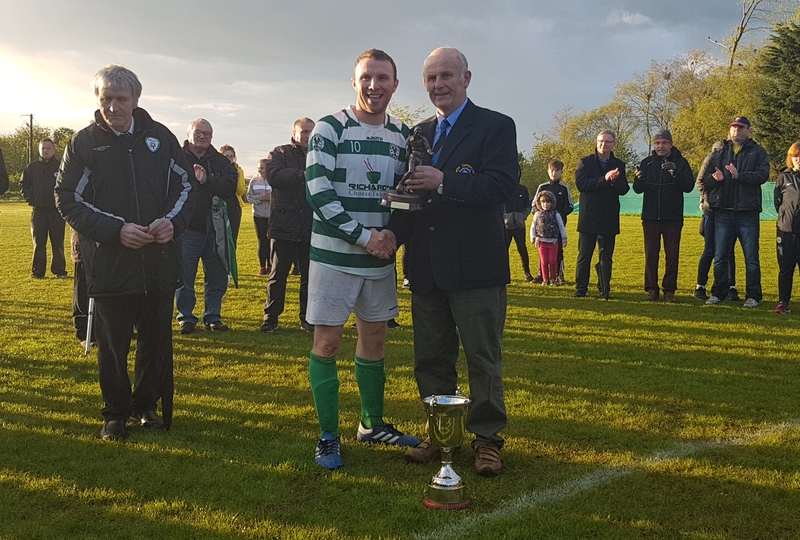 Nenagh Celtic’s Jimmy Hynes was named the man of the match following the Tipperary Cup final on Saturday evening. Holycross FC found themselves three goals behind in the 38th minute - the division one champions disputed a throw-in which was awarded to Celtic on the left flank and just inside the Holycross FC half. Holycross FC were not alert to the danger when Seán Healy threw the ball to Michael Hynes who was unmarked and subsequently allowed to turn and float a glorious cross in over the head of the opposition left-back on the opposite side of the field; Jimmy Hynes controlled the delivery smartly and buried his low shot from a tight angle (3-0). Three minutes into the second half Nenagh Celtic came agonisingly close to opening a four-goal lead - Danny Ryan intercepted a Holycross FC kick-out and steered the ball into the path of Jimmy Hynes down the right in one smooth movement; Ryan then galloped forward to hit Hynes’ return first time, but fired his shot narrowly wide. In the 51st minute Brian Mitchell’s searching corner was cleared off the Holycross FC line, but Holycross FC enjoyed a terrific goal-scoring opportunity of their own in the 53rd minute when Seánie Comerford’s half-volley was blocked on the line. Holycross FC - 2017-18 Tipperary Cup finalists. Holycross FC, to their credit, battled their way back into this contest and their supporters had something to shout about in the 58th minute when Celtic ‘keeper David Walsh pushed a rasping Dan Corbett free kick over the bar. And, in the 64th minute Holycross FC were rewarded for their endeavour - Seánie Comerford’s corner broke to JP Butler and although Butler’s shot was blocked Dan Corbett was on hard to bury the rebound (3-1). Brian Mitchell and Eoin O’Riordan exchanged half chances late in the game before Nenagh Celtic settled the issue in the 87th minute when Mitchell clipped the ball over the advancing Rob Quinlan with time fast running out. Nenagh Celtic: David Walsh, Alan Kelly, Seán Healy, Stevie Ryan, Paul Walsh, Danny O'Donoghue, Danny Ryan, Michael Hynes, Mark Walsh, Jimmy Hynes, Brian Mitchell. Subs: (78th) Jamie Kelly for Michael Hynes, (82nd) Paddy Lynch for Danny Ryan, (88th) Adam Healy for Alan Kelly, (88th) Anton Provotorov for Danny O'Donoghue. Holycross FC: Rob Quinlan, James King, Liam Ryan, Dan Corbett, Paudie Doran, Jerry Ryan, Kevin O'Dwyer, Stevie Flanagan, Tommy King, Seanie Comerford, Philly Fogarty. Subs: (HT) Davy English for Kevin O'Dwyer, (HT) JP Butler for Paudie Doran, (60th) Aaron Delaney for Philly Fogarty, (60th) Eoin O'Riordan for Stevie Flanagan, (70th) Eoin Ryan for Tommy King.